There are about 372 species of parrots in the world. Most parrots are found in tropical and subtropical regions including Australia and islands of the Pacific Ocean, South Asia, South East Asia, South America, Africa and the southern regions of North America. They are very intelligent birds and they make good pets. Most parrots are faithful partners. The Hyacinth Macaw is the world’s biggest flying parrot, and also the world’s longest parrot. It can grow up to a metre (40 inches) long, and weigh between 1.2 to 1.7 kg (2.6 to 3.7 lb). However, the world’s heaviest parrot is the Kakapo from New Zealand, which can weigh up to 3.5kg (7.7 lb). Both the Hyacinth Macaw and the Kakapo are endangered. The Kakapo is critically endangered – there are only about 100 of these birds left in the whole world. They have a strong sharp curved bill and strong sharp clawed feet. Most parrots are able to use their feet to handle food and other objects, just like we use our hands. Whether an adult parrot is left-footed or right-footed depends on the species of the parrot. A left-footed parrots prefer to use its left foot, and a right-footed parrot prefers to use its right. They often use their bills for climbing by gripping onto tree branches. They tend to walk with a rolling movement. Many parrots are brightly coloured and some are very beautiful with multi-coloured feathers. A typical example is the Scarlet-Chested Parakeet. The male Scarlet-Chested Parakeet is green on the upper feathers with a bright blue head and bright scarlet chest with yellow tummy. The female is green on the upper part of the feathers and yellow underneath, with blue face and blue wings. Parrots eat seeds, nuts, fruit, buds, nectar, pollen and sometimes animals like snails. For example, Golden-Winged Parakeets eat water snails. Parrots are seed predators, unlike fruit bats which are seed dispersers. This is because they eat the seeds in the fruits, they don’t eat the fruits and drop the seeds. Parrots are able to remove the layer of poison in the seeds if there is any. 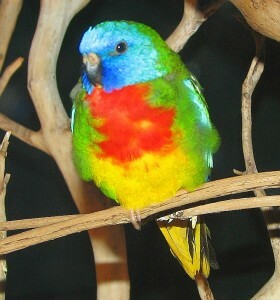 The Lories and Lorikeets, Hanging parrots and Swift parrots eat mainly nectar and pollen. They have tongues with brush tips to collect nectar and pollen. Only the Monk Parakeet and five species of Agapornis Lovebirds build nests in trees. There are three Australian and New Zealand Ground Parrots nest on the ground. All other parrots and cockatoos nest in tree hollows. Some even use termite nests, so they become less noticeable to their predators! They will often use sticks, wood chips and plants to build their nests. Larger species of parrots have trouble finding places to build their nests. As a result of that, sometimes there will be fights between them or with other birds over good nest-building spots. Parrots have white eggs. Normally, mum will keep her eggs warm. But for the cockatoos, the Blue Lorikeet and the Vernal Hanging Parrot mum and dad will take turns keeping their eggs warm. When the chicks first hatch they are helpless, featherless and blind. The chicks will stay about 3 weeks to 4 months in the nests – the amount of time depends on the species. The parents take turns finding food and keeping the tiny chicks warm. When the parents are not in the nests with the chicks, snakes and goannas may try to eat them. The parents store food for their chicks in a sack in the throat. The sack is called the crop. When their crops are full the parents will know it is time to return to feed their chicks. Parrots are the most intelligent birds. They are able to copy human’s speech or other sounds. 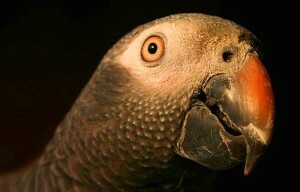 For example, the African Grey Parrots has great learning ability. Wild African Grey Parrots will end up copying the sounds of other wild birds. Parrots do not have vocal cords. So sound is produced by changing the depth and shape of their windpipe. Some parrots like the Kea can even solve puzzles if they are taught how to. Parrots learn better when they are provided with natural environmental stimulation. For example, if a caged bird in a zoo or a parrot kept as pet is not given any learning stimulation from young, they may develop destructive behaviour like plucking out their own feathers. This is because they are too bored and they need to find something to do. An absence of stimuli can stop the development of young parrots. For example, a group of Vasa Parrots were kept in tiny cages with chickens from 3 months old. At 9 months old these parrots still behaved as if they are 3 months old, and sad to say they behaved more like chickens than parrots. Parrots can bring good and evil to mankind. They can be a source of income for pet shops and bird watching tourism companies. They also creates specialist jobs like vets who streat only birds, and people who breed and sell parrots. On the other hand, some parrots are farm pests. They eat fruits on fruit trees, grains and other crops. For example, the Rainbow Lorikeet is a pest in Australia. Unfortunately, many parrots species are declining. Several are extinct. The reasons of declining is due to habitat loss, illegal hunting for the pet trade, for food and for feathers. A rare parrot can earn a lot of money for a poacher, but when he catches one, the parrot becomes even rarer, and more endangered. Some large parrots species like large Cockatoos, Amazons and Macaws can live for a long time, up to 80 years old. However, small parrots like Lovebirds, Hanging parrots and Budgies can only live between 15 to 20 years. 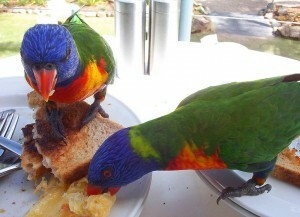 Rainbow lorikeets are a pest in Australia? Since when is a native bird species a pest? They’re annoying to lazy people who don’t clean up after themselves and leave their toast on the verandah for the birds to eat. I think their advantageous and see a quick and easy meal and go for it. Any creature would.